As Henry Ford once said “Coming Together is a Beginning. Keeping Together is Progress. Working Together is Success. Our representatives demonstrate years of hard work for the clients we serve. 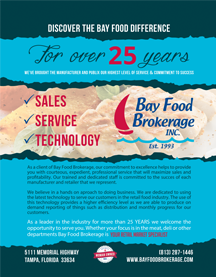 Why Choose Bay Food Brokerage? Bay Food Brokers has established core values that are a crucial part of our success. Founding executives are present in the daily operations of our company and have built longstanding personal relationships with each of the manufacturers that we represent. Our ability to accommodate manufacturers needs is what sets us apart from other food brokers. One hundred percent of our manufacturer relationships have been retained since their inception. Our vision and values have cultivated these manufacturer relationships and have proven to provide continual increased revenue and business expansions for each client we represent. In order to rank among the highest in our industry, Bay Food Brokerage realized that in order to maintain customer satisfaction we had to deliver superior results. Since our opening in 1993 Bay Food Brokerage has only employed skilled, highly motivated professionals that consistently get the job done! Bay Food Brokerage realizes that manufacturers require complex processes, accuracy and efficiency. We’ve taken the time to specifically train our staff members on every aspect of our business. From corporate intake to deliver of professionalism to our clients, Bay Food Brokerage staff members have demonstrated these commitments to excellence. Our expansive manufacturer list helps recognize that this would not be possible without the collaboration of our staff and clients. Our technological innovations also play a huge part in achieving our mutual goals and successes. Maintaining our unmatched commitment to excellent service has proved to attribute to the success of our customers. This would not be possible without our retail representatives, field staff and key corporate administration. Bay Food Brokerage has presented a unique perspective to doing business for the last 20 years and are proud that our manufacturers have grown to depend on these staff members. With over 20 years experience in Perishables and Representation in 6 states and growing, we can help you achieve success.